Trainer Pat Webster says he's placed Happy Clapper badly over the past couple of years but there's method to the apparent madness. 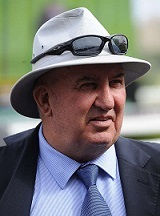 Trainer Pat Webster (Pic: Bradley Photos). There's no subtle way to say it, if there were other options than being in the shadow of Winx most of the ten times they've met has then Webster would have taken them. He doesn’t regret racing her – Happy Clapper has earned $964,800 from his five seconds plus another $395,000 for a third behind the champ in last year’s Queen Elizabeth. Webster doesn't like being the punching bag for a champion but for the most part the end has justified the means - Happy Clapper is a multiple Group 1 winner who certainly hasn't been 'Winxed'. "It's always been a 'necessary' and a 'have to', rather than a 'want to','' Webster said. "Because I tell you there are times I haven't wanted to. "I've had to run against her to get to the races I wanted to. I can't go around in benchmark races so I have to run in the lead up races at weight-for-age. Two of his five seconds have come this preparation – in the Apollo Stakes in February and his daring catch-me-if-you-can attempt in the Chipping Norton in March. After recovering well from an internal bleed in Melbourne, Happy Clapper will face Winx for the 11th and final time the Group 1 $4m Longines Queen Elizabeth Stakes (2000m) at Royal Randwick on Saturday. Webster said he'd thrown up the white flag as far as any thoughts of ever getting the better of her a while ago. With all due respect to Happy Clapper he won’t be causing an upset. "It's amazing how many people come up to me and say 'I hope you beat her' but it's not the Australian way,'' he said. "It was different when we ran second to her in the (2016) Doncaster because no-one knew she was as good as that then. "He's the only horse in history to win a Villiers, Epsom and Doncaster. What he's done away from her is part of what makes her so great. Webster firmly believes Winx could do anything – if she was set for an Everest she could win it. He'd dearly love to be able to view her from an angle other than that of regular fodder in her races but he’s also proud to be an important part of her story. Happy Clapper is one of two warhorses, the other of course being Hartnell, who will forever be linked with the Winx story and Webster says it’s fitting both are there on Saturday. Between them they've won $13,228,599 - that pales in comparison to Winx's $24 million and change but that doesn't lessen what they've achieved. “He's a great horse Hartnell, I take my hat off to him,’’ he said. “We're privileged to be around in the same breath as Hartnell, she's in her own breath. She’s this machine...she's not big and strong, she's just a machine. While it’s the end for Winx on Saturday at start 43, Happy Clapper will likely pass her on the score of starts with another season of racing beckoning. Happy Clapper is facing Winx because his owner Michael Thomas selected the race, and an extra week's preparation over the challenge of another Doncaster with 59kg on a sticky track. Webster is fine with it saying the post-Winx era will present plenty of new challenges for Happy Clapper. “I can't understand people even suggesting to retire him when you look at his first two runs this time in,’’ Webster said.